Checkin’, movin’, tearin’ out, buildin’, or fixin’ . . . just the other day, half the cattle herd was in a place they shouldn’t have been. Yep, more fence to be fixed. We’re not the only ones, either. My Cowboy spent a couple days helping build and fix fence at my sister’s farm recently. Me? I opted to spend my time doin’ all my fencin’ on a quilt. A Rail Fence version of a patchwork quilt. And the pattern for “Forever Fencin'” is finally ready! You can see from the picture that we had lots of help with the photo shoot. Batman needed to make sure that all was going as it needed to. I knew lots of you would object (as has happened before) if, after he worked so hard to help, I removed him from the cover photo, so I left him in this time. He’s a pretty good (and very attentive) helper. And, too, I thought you’d get a kick out of his precarious position while perched on top of the fencepost! How funny is that? The quilt finishes at 60″ x 78″, so it’s a great “cowboy-sized” throw quilt. You can use up lots of little scraps making it, too. The pattern has complete instructions, with diagrams, for how to make the quilt, and comes in a printed version or a PDF version. It’s available in my Etsy shop now. The introduction of a new pattern means . . . what does it mean? . . . yep, you guessed it . . . a give-away! As usual, I’m giving away 2 copies of the pattern to celebrate finally having it finished. All you have to do to enter to win is leave a comment on this post. I’ll pick two winners on Friday, October 19. Each winner can choose whether they want the printed version mailed to them, or the PDF version emailed to them. It’s as simple as that! Love the picture of Batman, at first I thought it was a “What’s Wrong with this Photo?”! The new pattern is wonderful, I may have a scrap or two around here. Thanks for the chance to win! I hope your fences don’t “bite”. I remember getting bit by an electric fence when I was a kid growing up on the farm. It didn’t help I was standing in snow when trying to climb over the fence. After that I was terrified to go anywhere near the hot wires. I really like the fall colors in your quilt. This would be the perfect quilt to cozy up under as the fall winds are blowing outside. Love this one Shelly! Congrats on your newest pattern. LOVE THE NEW PATTERN? SO COOL TO SEE YOUR KITTY IN PIC. 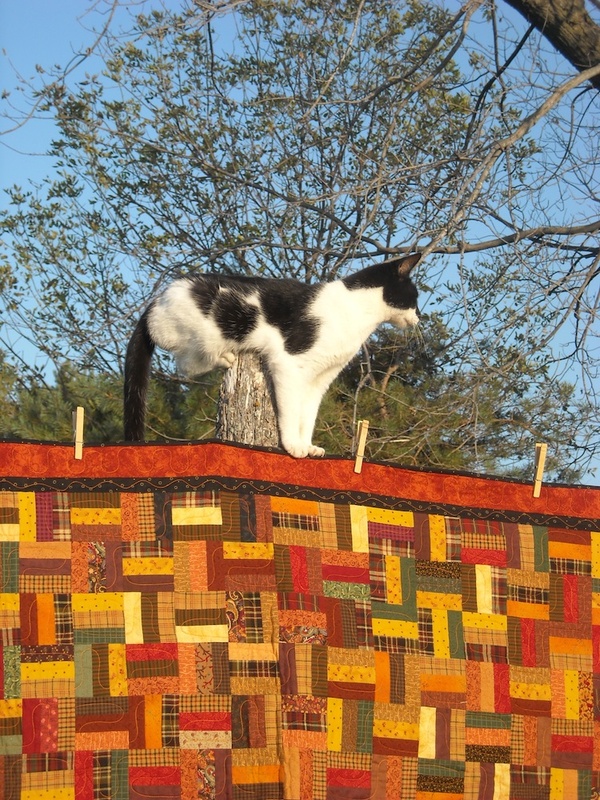 WHEN I MADE MY HUBBY A QUILT WITH BRUSHED HOMESUNS I ALSO MADE ONE FOR MY “MISS KITTY”. WE lost her this past summer at 18 yrs. She was buried with her favorite “blankie.” Every quilter should have a loving pet to share their craft with. Keep up thegood work. Beautiful quilt. Loved your photo shoot. I love the colors in this quilt! 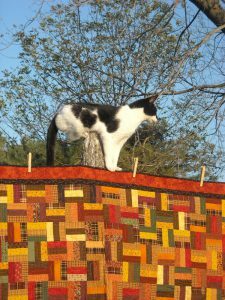 Batman did a super job of as quilt model. Thanks for sharing and for the chance at your giveaway. 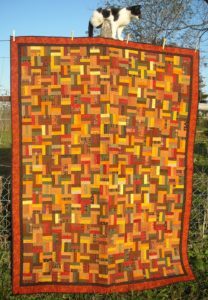 Your quilt is beautiful – the colors fit the season of Autumn! I am so glad Batman made the cover! Can that cat levitate? 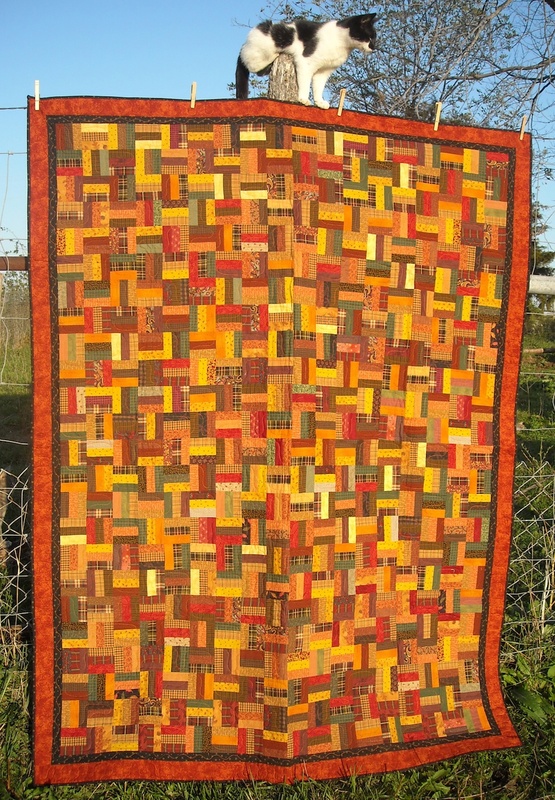 Very nice quilt and I love all the fall colors. I have a layer cake that I should cut up, maybe this is the pattern. Great quilt. Terrific fall colors. Think I’d rather work on a rail fence quilt than work on a real fence. Love the colors of your new quilt! Very fallish. I think the pattern cover looks great with Batman on there…..so does he! The colors are beautiful, Shelly! I love it! And the cat in the photo just sets it off perfect. I noticed his precarious perch. What a hoot! Now that’s my kind of fencin’!! Wonder if I can get away with telling hubby I’ve been fencin’ all day! Not sure this kind will keep the cattle in though. What a great pattern and I’m thinking it’s the solution for what to do with all of these scraps! Oops, forgot to add: If I win, is Batman part of the deal? yet another example of your wonderful genius for fabric, words, and animals…………all together! Fencing—I hear ya!! Although, we don’t have near as much as you probably do, I understand how it feels like a never ending job!! I love this pattern! That is too funny how Batman is sitting on the post in the picture. I’ve just recently found your blog…am loving it and your creativeness! This “fence” quilt reminds me of the old cowboy song “Don’t Fence Me In”. Since I’m in IL with a fire going today, this quilt would be perfect. Would love to win the PDF pattern and the opportunity to use up scraps. Your cat reminds me of my daughter’s cat with similar markings, who answers to Cowman…love black and white kitties!